The Schillerverein wishes to preserve the living memory of Friedrich Schiller within in the context of his birthplace, Marbach am Neckar, which is also the seat of the Schillerverein itself. The Schillerverein was founded on 18 June 1835 as the “Verein für Schillers Denkmal”. Later it adopted the name “Schillerverein Marbach am Neckar”. Initially work commenced in the years 1835 through 1840 to transform an old quarry (Schelmengrüble) into the Schillerhöhe. King Wilhelm I of Württemberg donated trees and shrubs from the exotic garden located on the grounds of his palace in Hohenheim. Although at that time it was not possible to erect a Schiller monument, the fact that Stuttgart gained generous support during the time of the so-called “monument dispute” led finally in 1839 to the construction of the Stuttgart Schiller memorial, designed by the Danish sculptor, Bertel Thorwaldsen. 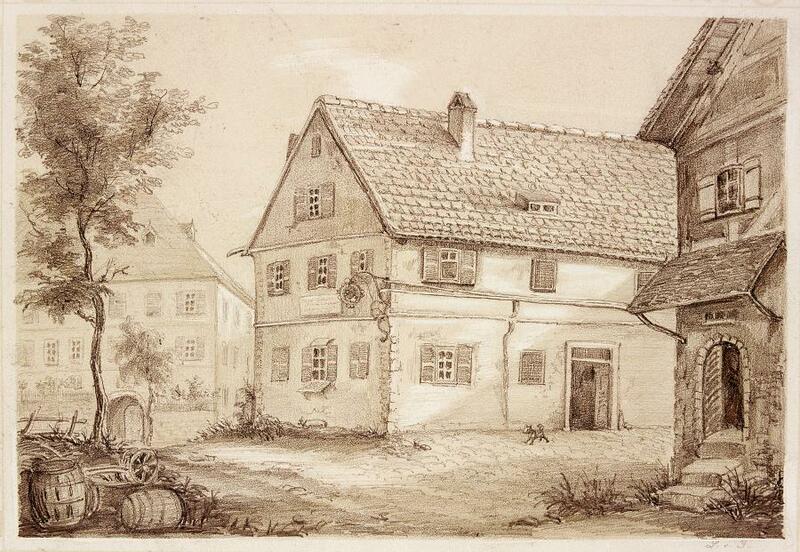 With the house where Friedrich Schiller's was born the citizens of Marbach knew they had a treasure whose importance no one would contest and thus the Schillerverein acquired it in 1857, transforming it into a memorial site that first opened to the public on 10 November 1859, the 100th anniversary of Schiller's birth. At the same time, responsibility for the care of the double tomb of the mothers of both poets, Schiller and Mörike, in Cleversulzbach, the so-called “Dichtermüttergrab”, was also transferred to the Schillerverein. The cornerstone for the Schiller monument was laid on the same day the memorial site first opened. The later monument was designed by the sculptor Ernst Friedrich Rau and was cast by the firm of Pelargus, located in Stuttgart. Kaiser Wilhelm I of Germany donated 32 hundredweight of bronze taken from French cannons for the construction of the statue. The ceremonious unveiling of the Schiller monument took place on 9 May 1876. Thus, in the year of its founding in 1835 the Schillerverein had fulfilled the goals which it had set for itself. Since then it has continued to fulfill its obligation to keep alive the memory of Friedrich Schiller by devoting its efforts to maintaining as a museum the house where Schiller was born, as well as taking care of the graves of the mothers of both poets, Schiller and Mörike. In 1976, the 100th anniversary of the dedication of the Schiller monument gave new life to the Schillerverein, going beyond its original obligations, which at that time also assumed the new roles of chronicling the history of the town of Marbach and the cultivation of local traditions.